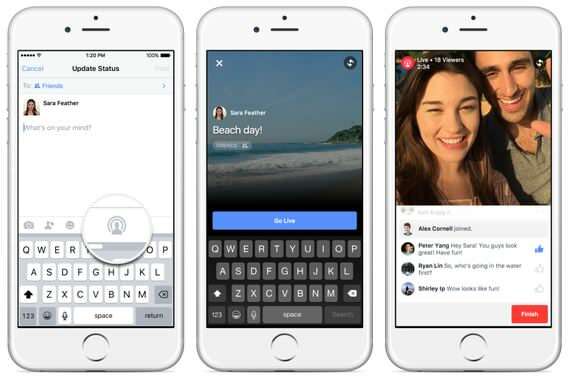 Facebook has announced that it is rolling out a new Live video broadcasting feature on its iOS app. The Live feature allows users to record and share video in real time using the Facebook appl. The new feature is Facebook’s take on Twitter’s popular live video broadcasting app called Periscope, which is available for Android, iOS and Apple TV. After Live is enabled, you will find a new “live video” option when you tap to create a status update. The Live feature will allow you to share a live video feed from the phone’s camera. Once you select “Go Live” option, you will see names of your Facebook friends who are watching, and whatever comments pop out. Facebook’s live-streams won’t disappear after 24 hours, as they do onMeerkat and Periscope. Instead, broadcasted video replays will show up on your timeline and stay there until you decide to delete them. The new feature will be initially available for iPhone users in the US before rolling out globally and for other mobile platforms.